sanctuary against invading Ugandan exiles and Tanzanian forces. Former BBC Africa correspondent, Brian Barron, recalls his encounters with Ugandan dictator Idi Amin. A selection of quotes attributed to Uganda's ruthless former leader - and comments by people who knew him. 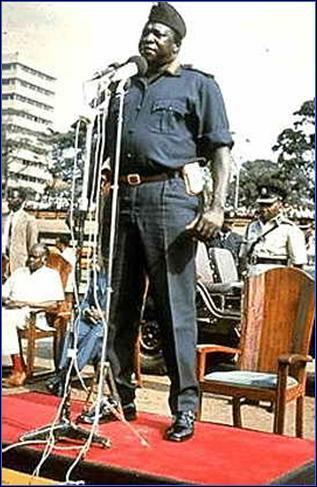 Idi Amin was a figure of fun to the West, but a tyrant who condemned his country - Uganda - to a decade of fear. The death of former dictator Idi Amin prompts a muted reaction from expelled Ugandan Asians who settled in Britain. Former UK foreign secretary Lord Owen reveals he proposed the assassination of the Ugandan dictator. A young BBC researcher remembers the former president's final TV interview before being ousted from power. 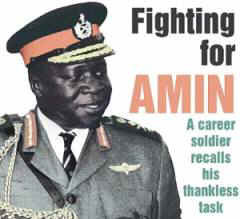 President Museveni says that Idi Amin will be tried if he returns from exile, while his condition reportedly improves. foreign visit - troops seal off Entebbe airport. My name is Margaret and I am co-author with Idi Amin’s son Jaffar Amin of a newly published book titled “IDI AMIN: HERO OR VILLAIN? HIS SON JAFFAR AMIN AND OTHER PEOPLE SPEAK”. I am recruiting people to read the “E” version of the book and offer opinions about the controversial and conflicted legacy of Idi Amin which will be compiled into a series of follow up books. Let me know if you or others might be interested in participating in the project. ALL OPINIONS WILL BE INCLUDED!